Hanoi is a hectic collage of sights, sounds and smells. Masses of motorbikes roar down roadways, and bike and car horns are constantly honking. Women wearing traditional conical straw hats carry poles with baskets on each end, small shops overflow with colorful embroidery, food vendors sell cooked pigeons with their heads still on, and signs cover buildings. For more than 4,000 years, from a humble fishing village to a busy seaport, the city has thrived along the banks of the Red River in Northern Vietnam. The seaport was given the name Ha (river) Noi (in) by King Minh Mang in 1831. Hanoi is the country's intellectual and cultural heart that draws the best and brightest artisans from around the country. Many streets in the old district are named after the products made there at one time, and you can still come across shrines here and there dedicated to an artisan's god. As the northern capital, Hanoi was heavily bombed during the Vietnam War. Still, there are reminders of the past, including French colonial architecture and 1,000-year-old temples and pagodas. The capital city, home to 6.5 million people, boasts parks with gnarled banyan trees and many lakes, some peppered with swan boats. The Hoa Lo Prison or "Hanoi Hilton" where U.S. Sen. John McCain was imprisoned as a POW is now the site of a high-rise. Really nice hotels and high-end shopping also beckon tourists. Most cruise travelers reach Hanoi via Halong Bay where most of the large cruise ships anchor. The bay itself is one of Vietnam's most celebrated attractions, with about 2,000 limestone islands that make up a spectacular natural UNESCO World Heritage site. A trip on the water of the bay is the kind of awe-inspiring experience travelers crave. Sit in a Vietnamese junk (boat) on silk couches and drink green tea or local beer as you cruise into the mist of the large bay, past giant, craggy limestone formations protruding from the sea. According to legend, a dragon sent by the gods to help the Vietnamese fight Chinese invaders, fell into the bay and formed the islands. In fact, these islands have seen their share of warring -- the bay is in the Gulf of Tonkin, where Vietnamese and U.S. forces first fought. The islands are mostly uninhabited, and many form odd shapes -- one looks like a man's face in profile, another like two roosters fighting. Their sheer cliffs and otherworldly presence has inspired writers, poets and artists. And it's easy to see why. The place is magical. Cruise ships dock at a number of different ports in the Hanoi area: Halong Bay, Haiphong and Cai Lan. Most ships dock or are tendered at Halong Bay, about a 3.5-hour drive from Hanoi, because it's one of the deeper ports and a wonderful tourist destination in its own right. Cai Lan is a relatively new deep-water port about 10 miles from Halong Bay and two to three hours from Hanoi. It is a busy cargo port serving only a handful of cruise ships and has no passenger amenities. Haiphong is Vietnam's third largest city and northern Vietnam's most important seaport. The port city is located on the Red River, about 62 miles from Hanoi. It is still used by cruise lines, including Crystal, Oceania and Regent. The ships dock in the container port where there are no tourist attractions or facilities, although there is dining and shopping in Haiphong city. 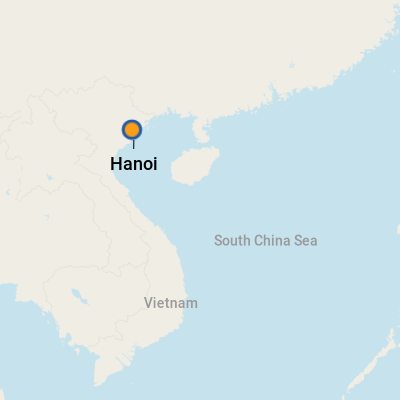 Hanoi is about a 1.5-hour drive from the port. Many large cruise ships anchor in Halong Bay, and tenders take passengers on about a 10-minute ride into the tourist town of Bai Chay where an old car ferry is used to load and unload cruisers. Getting to land from the tender can be a difficult transition for handicapped walkers and those in wheel chairs; so contact the ship for help before getting on the tender. Bai Chay, which along with nearby Hong Gai is collectively known as Halong Bay City, is the main tourist area for Halong Bay. Turn left from the tender pier and walk about 15 minutes to shop for souvenirs, coffee and other goods at tourist markets. Cafes there offer refreshments, and Internet access can be found at Emotion Cybernet Cafe for about 400 VND per minute. Adjacent "hotel alley" is another source of Internet cafes and Wi-Fi access. At the Halong Bay commercial pier, a boardwalk offers souvenir stalls, casual cafes and outdoor disco stages. In Hanoi, motorbike traffic can make crossing a busy street rather terrifying. Tag along with locals to cross, because there is safety in numbers. Negotiate cab fares upfront to avoid "add-ons" at the end of the ride. And of course, don't wear flashy jewelry and always protect your valuables from pickpockets, especially in busy markets. A junk cruise on Halong Bay can be the highlight of your trip or a major disaster. Many commercial junks are in poor repair and fall short of Western safety standards. The lower the ticket price, the more likely you'll find yourself on one of these sketchy junks. In this case, you get what you pay for. Booking once you've arrived in Halong Bay also increases your chance of getting ripped off or falling victim to bait and switch. Do your homework on TripAdvisor, Cruise Critic and other boards to find the junk trip right for you, and reserve it in advance. Getting to Hanoi: The best way to get to Hanoi from any port is to arrange transport via your ship's shore excursion shuttles or a car or van with a driver hired from a reputable tour company. Taxis can be a cost-saving option, especially for three or four passengers (five will fit in some cars and vans), but their numbers are limited. Most taxi drivers do not speak English, so make sure the fare is settled before getting in the car. Also, be wary of English speakers around the port areas who are willing to negotiate with taxi drivers. If they ask you to pay them instead of the driver, be aware that you are probably being overcharged. Shop around if possible. In Hanoi: A taxi is the best way to get around in the city. You also can arrange a driver and guide before the cruise. If a taxi driver tries to negotiate a flat rate, it probably is not to your advantage; reputable taxi companies will have metered cars. Two reputable taxi companies are Hanoi Taxi and Taxi CP. Public buses are not recommended. The main unit of currency is the dong (VND), which comes in both notes and coins. For updated currency-conversion figures, visit www.oanda.com or www.xe.com. U.S. dollars are also widely accepted: Carry plenty of crisp $1 and $5 bills to buy souvenirs (if you use larger bills, your change may be in dongs). You can find ATMs at branches of Vietcombank in Halong Bay and Hanoi. Vietnamese is the official language. English is spoken in hotels, restaurants and tourist shops in Hanoi but is less widely spoken in Halong Bay. For a spur-of-the-moment translator, look for a 20-something who might have studied English in school. Older folks might speak French (from the country's days as a French colony). In Vietnam, like the rest of Asia, rice and noodles are food staples. As a result of the French colonial period's influence, the cuisine is admired by food lovers around the world. Fresh herbs and hot chilies are found in many dishes including their equivalent of fast food, pho soup. Pho (pronounced fuh) is flavored with fresh vegetables and savory stock, and is a breakfast, lunch and dinner favorite. Vietnam's long ocean coast and abundant rivers and lakes are sources for fish, crab, shrimp and squid commonly found on menus. Nuoc mam, a pungent fermented fish sauce, is the preferred condiment, found on almost every dining table in the country. For a change-of-pace from local cuisine, try the Moose & Roo Pub & Grill. Food is a bit more expensive than local Vietnamese spots, but well worth it if you crave an American-styled pulled pork sandwich, fish taco or cheeseburger. The restaurant boasts a great selection of foreign and domestic beers. Service is professional and friendly. (42b Ma May; +84 4 3200 1289; open for breakfast, lunch and dinner). In Halong Bay City: Unless you're on an overnight junk cruise, Halong Bay isn't known for its dining scene, especially for visitors. It's probably best to return to the ship for a nice meal. New resort hotels are being built, which might improve dining options. Hanoi has great bargains, especially in Hang Gai located in the city just north of Hoan Kiem Lake. Some of the "antique" items there might not be so antique, but they can make great souvenirs for a good price. You'll also find silk goods (purses, scarves and suits) and crafts, including lacquered and embroidered items. Near the Temple of Literature on Van Mieu Street, there is a nonprofit store, Craft Link, with a great reputation for beautiful locally made crafts.